This is to confirm that the photos of our condo are true pictures that depict our condo and the contents therein and are not that of a model home. All pictures of the inside of our condo and the patio by Erika Lauren Photography. Please note that trucks, commercial vehicles, campers, mobile homes, recreational vehicles, motor homes, house trailers, trailers of every other description, boats, jet skis (or other similar watercraft) boat and other watercraft trailers, horse trailers or vans shall not be permitted to be parked or to be stored at any place on the property, or on the Vista Cay resort. Also, please be advised that the home that you are renting is located within a condominium which contains certain amenities and common areas (including but not limited to the swimming pool, gym, elevators, sauna, alarm system, etc…) which may from time to time not be fully functional or operational or may be under repair as managed by the building administration such that the use of these areas and/or amenities may be unavailable or limited during your stay in the condo. In this context, while we recognize and regret any resulting inconvenience to our guests, the owner of the home will not be responsible for any such events of outage or unavailability and shall have no responsibility or obligation to grant any discount or refund of any of the rental fee as a result of any such circumstances. •	A 'mandatory evacuation order has been given for the Tropical Storm/Hurricane Warning' area of residence of a vacationing guest. o	Any advance rents collected or deposited for a reservation that is scheduled to arrive during the 'Hurricane Warning' period. We're a family of 6 with 4 children so it's anyone's guess why we chose Orlando as our second home. We reside in southern Ontario and try as much as possible to travel to our condo whenever the children are on school holidays. Our penthouse is also our vacation home and we take great pride in sharing it with our guests. My husband and I were born and raised in Kenya which is where the African inspired concept came from. We always knew that Florida would be a place to have our second home, especially considering that we reside in the cold north. This is a place we want to travel to during our winter months when we finally retire and as well a place where our children and theirs could enjoy their vacations at. Besides that, we are only a couple of hours away by air from Buffalo so this was another plus in choosing Orlando. We chose Vista Cay in Orlando because it's central to everything we would ever need. We're an hour from the beaches and ideally located to almost any place within Florida that we want to travel to. Vista Cay is an upscale resort. Their standards are very high and their grounds are always immaculate. We love the fact that it's also a gated community thus giving you a sense of security. I love the lake and the view from our condo. We always wanted a view of the water at our second home and the lake is a welcome sight. At night, we can also enjoy the fireworks from SeaWorld on our balcony. Our children enjoy the heated pool when we return from a long day out at the parks or they can watch a movie in the theatre room or play at any of the games table. There is so much to do at the resort that you don't even need to step out of the site at all. 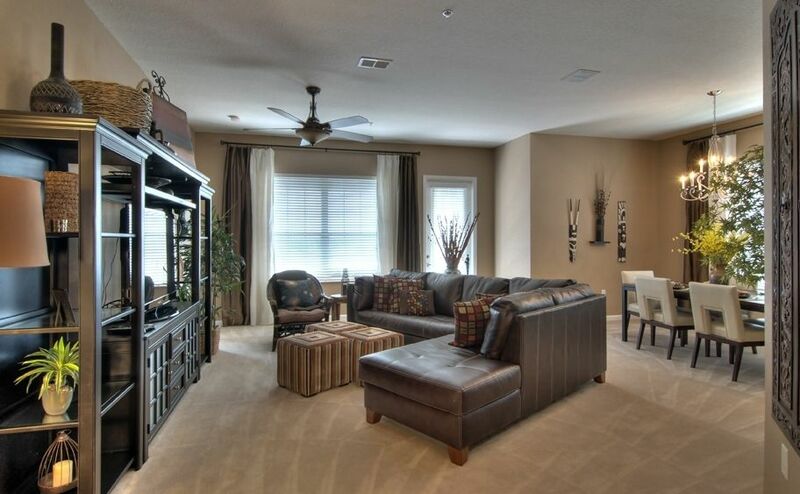 This Orlando condo also offers a free local calls telephone system to our guests. The Laundry room is fully equipped with a large capacity washer, dryer and ironing facilities. Secured WiFi is available and free for your use. Oversized patio with loveseat, coffee table, 1 chair and another set of 1 table and 2 matching chairs. Our condo is fitted with a combination lock for your extra convenience and safety. 2 Umbrella Strollers; 2 Child Dining Chair Booster Seats; 1 High Chair; 1 Pack 'N Play available for use. Hairdryers in all bathrooms. We had an excellent stay in this condo. It’s well maintained, very clean and way bigger than it looks in the pictures. Owner thought of everything when stocking this unit. Washer and dryer and laundry room were great for all of our wet suits and towels. We will definitely stay here again! This was my third time at Vista Cay Resort and by far the most beautiful condo. It did cost more but it was worth it. The only thing that would be better would be a Keurig coffee maker. The owners thought of everything! There are even bathroom scales! The balcony view is much prettier than the pictures !!! We saw an alligator in the water two days separate days. It is VERY close to absolutely the best restaurants and events. You will be in the center of everything!!!! Sit back relax and enjoy.....you’re at home! My family of five adults and two small children recently stayed in this lovely condo during our visit to Orlando. I have rented dozens of apartments in Europe and the US, and this one was the most well equipped I have ever stayed in. Our host provided everything we could possibly need, extra blankets, towels, laundry and dishwasher soap, etc., all well labeled and organized. The condo is quite spacious and comfortable, with a nice balcony and wonderful view. Alvina was very responsive and helpful, so easy to work with. I only wish I could have stayed longer !! Was the perfect place for our family vacation! The condo was absolutely perfect for our universal vacation! It was decorated beautifully and well stocked with everything we needed! I would defiantly stay here again! Beautiful Condo. Great Location. We will be back for sure! This place was Huge! We stayed with our 3 small children and Au Pair. We had more room than we knew what to do with. The condo was immaculate and well furnished. The beds were comfortable and the kitchen fully stocked with everything on hand. When we put the kids to bed, we relaxed on the quiet and private balcony enjoying the view and even caught some fireworks in the distance. The complex was just as nice, we spent a day at the pool with family, tried to keep the kids away from the arcade/game room. Also, very convenient with a Walgreens that you could easily just walk to for any day to day needs. Spent days at the parks which are very close. We will be back again next year for sure. Thank you! This place was perfect for our group and the owner was so easy to work with. The condo was stocked with everything we needed to settle in. Prime Location - minutes to Orlando International Airport, Disney World, Seaworld, Downtown Disney, Universal Studios, Gatorland, designer outlet malls, International Drive, Wonderworks, world renowned restaurants and walking distance to Publix supermarket, Orange County Convention Center and Golf at Shingle Creek Resort. 60 minutes away from Cocoa Beach and Kennedy Space Center. 1. A non-refundable $250 deposit in addition to VRBO's service fee is required as part of Payment 1 of 2. The $250 will be applied towards your total rent. 2. A mandatory damage insurance coverage of $59 is also required. Should you wish to cancel your reservation after you have made the $250 deposit and service fee via (VRBO's), please note that neither the $250 deposit nor the service fee from VRBO are refundable at any time. Kindly read further on the deposit and cancellations by visiting http://www.ssfvh.com/site/35041/Terms-and-Conditions.aspx. If you have any further questions, don't hesitate to contact the owner.